When EllaDee read our old post on the Somerville Museum in Bathurst, she suggested that we visit Dove and Lyre in nearby Newtown. Finally, this wonderful piece of shale from the Green River Formation in the Rocky Mountains (USA). We have a herring fossil from there, so I was chuffed to be able to add this one to our mantlepiece. Dove and Lyre is based at 459 King Street, Newtown, and run by the charming Rob and his lovely wife (and “boss-lady”) Di. They’re opened very civilized hours: 12pm – 5pm Tuesday to Friday, 11am – 5pm Saturday, and 11am to 4pm Sundays. They’re more than happy for folks to spend hours browsing, so long as they don’t break anything! What a collection! I used to have a bit of an obsession with amethyst when I was younger. I had some very pretty little pieces. What a find! 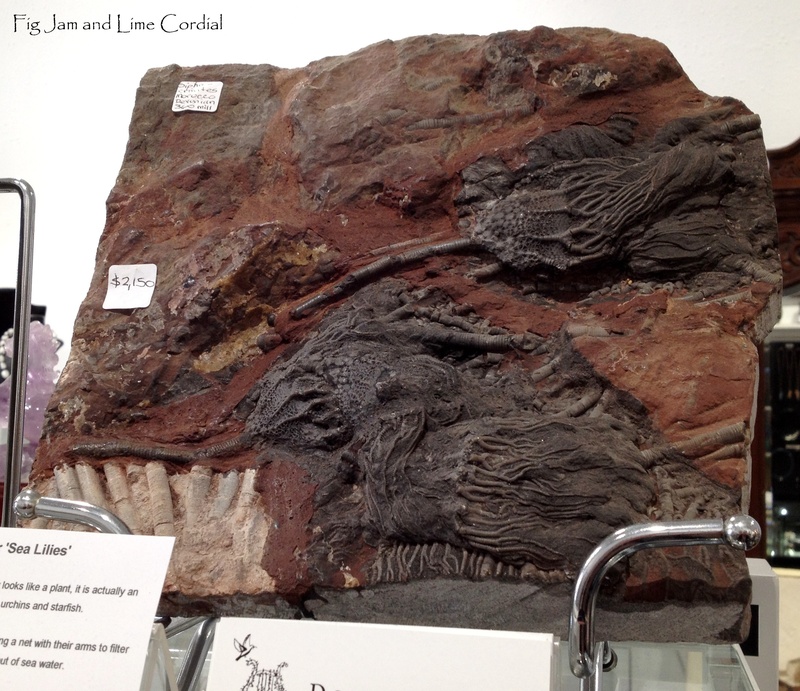 Love the detail in those fossilised lilies. We used to occasionally find trilobites in creek beds in southern Ohio where we grew up. Some houses there are actually built with fossil stone in the walls. We lived in one when I was a small girl. Those geodes are gorgeous too, all of it really. Thanks for sharing. Ardys, how cool to find trilobites in creek beds! And to be able to see fossils in the walls of houses! Beautiful- I love the big pricey items- but the ones you chose are so intimate and endearing! They fit with you! Thanks Heidi, they were only small, but they do indeed fit very well with the other pieces on our mantelpiece! Oh my goodness, what a treasure trove, Celia! I so agree with the others that place is a treasure trove, such amazing collection. How was the specimens collected and not damaged? Norma, the really amazing pieces were very expensive (although not as expensive as I expected) – I guess that reflects the rarity of getting such old fossils in great condition! I’m so pleased you liked Dove & Lyre. The people are nice, always happy to chat, and were really helpful with my Christmas shopping for the G.O. We’ve bought a few smaller items but managed to avoid – so far – temptation on the larger. The store is a great addition to King Street and just diverting to spend some time browsing the wonders. 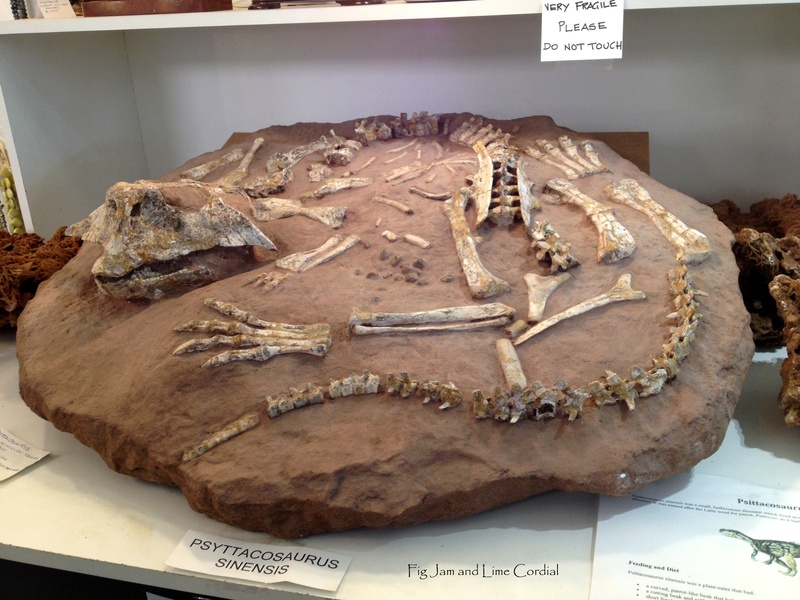 ED, it’s such a hidden treasure, who could expect a $38000 dinosaur fossil in the middle of Newtown? Thanks so much for putting us on to them! Maz, he really would! Some amazing old petrified wood pieces there he’d love! Charlie, the labradorite is iridescent, so when the light is at the right angle, it positively glows! My heart sings – the information will be stored – I hope for but a short duration!!!! It’s a great place to visit! Hehe now these people have the right idea about hours! None of this early morning stuff :) What an interesting store! What amazing pieces! I’m always amazed to look at the detail in fossils. They say that nature is the greatest artist and you have demonstrated that so well in this post. Thanks for stopping by, Deb! As you say, the detailing in the pieces is astonishing! Such an interesting store to spend a little time browsing or purchasing a little treasure. Karen, I really liked the fact that I could get a little fossil for $10, in the same shop that was selling a giant amethyst geode for $10.5K! Gee, that looks like fun. I can imagine spending hours in a place like that. They’re all so beautiful and interesting. I’d never, ever seen anything like that store… a place where they sell fossils etc. – amazing !! Each one is a truly unique and gorgeous work of art! Hi Celia, thanks so much for posting this. Have shown hubby this post, we have never heard of this store and it’s right up his alley we will have to make a visit. I think some of the pricing is quite reasonable. The fronds are so detailed, that is a beautiful piece. What an incredible place. You really did a great job with the photos, showing the detail on these. Every one I looked at I thought “oh, would I love that one”, and then I see the next one & want that one even more. I have to say that disc of petrified wood is maybe my favorite. How in the world did you ever decide on just a couple pieces though with so much to chose from? Thanks Diane – all taken on the iPhone too! :) I kept thinking that the petrified wood would make a wonderful side table or something, but it weighed a ton (and cost a fortune). It did take us a long time to choose, but I had a relative small budget (in fossil terms), so we could only afford a few small pieces. The labradorite is amazing – it glows the most amazing blue in the right light! Oooh I would love a look round that shop with my little man. Wow, I could spend all their opening hours just strolling around and wishing. I’m sorry Pete said no on that gorgeous piece. Maybe next year.